Please select a size. EU 36 - Low StockEU 37 - In StockEU 38 - In StockEU 39 - In StockEU 41 - Low Stock Please select a size. Wrap your look up with ease in this versatile Chantal heel from our very own party schuh collection. 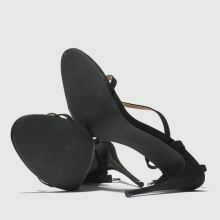 The man-made profile boasts a black strappy upper with long tie ankle straps for a custom finish. An 11cm stiletto heel completes the style with class.